Laura C. Manfreda is certified by the North Carolina State Bar as a specialist in family law. Laura has extensive knowledge in child custody, child support, equitable distribution, domestic violence and spousal support matters, and significant trial experience in the District and Superior Courts of North Carolina. Laura is a member of the North Carolina Bar Association-Family Law Section and the Wake County Bar Association. Laura earned her undergraduate degree in English and Political Science from the University of North Carolina at Chapel Hill and her law degree from North Carolina Central University. While in law school, Laura was a member of the school’s Trial Advocacy Team and was selected to serve as a summer intern for the Honorable Graham C. Mullen, the former Chief Judge for the United States District Court for the Western District of North Carolina. 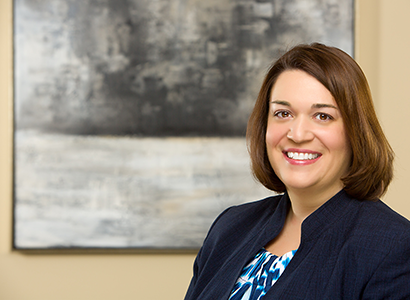 Prior to joining Ward Family Law Group, Laura practiced family law in Charlotte for six years. Laura enjoys presenting at seminars about family law issues. She was a guest speaker at the North Carolina Advocates for Justice Magic Mountain Paralegal Conference in Asheville, North Carolina in 2012 and a guest speaker for the Cary Chamber of Commerce in 2015. Laura understands that the process of divorce can be one of the most emotional times in a person’s life, and that each client is seeking an advocate who will listen and effectively protect his or her interests. As such, Laura strives to be a superior advocate and listener for each of her clients both inside and outside of a courtroom.